8 April 2016: The Evening Standard reports that “Hundreds more Londoners are buying electric cars as the scale of the capital’s air pollution problem is laid bare, official figures reveal today. They show a jump of more than 22 per cent in electric cars, including hybrids, registered in the city in the first three months of the year, nearly 800, compared with 650 in the first quarter of 2015. In the South-East, the rise was a huge 84.9 per cent, from 1,632 to 3,019.” EV sales data is available on the SMMT’s website – but not on a regional basis. “The number of electric cars registered in London has jumped from 61 in the whole of 2010 to a total now over 5,000. More charging points are being installed under the Source London scheme.” Read the full story here. Proposals to make London “the electric vehicle capital of Europe” were set out last summer by the Mayor in TfL’s Ultra Low Emission Vehicle Delivery Plan – which contains details on work to support the growth of EVs and EV charging infrastructure. To help private plug-in vehicle owners offset some of the upfront cost of the purchase and installation of a dedicated domestic recharging unit, the Government is running the Electric Vehicle Homecharge Scheme. New guidance on this scheme was issued by Government last week. 27 January 2016: “District heating as heterotopia: Tracing the social contract through domestic energy infrastructure in Pimlico, London” – new research paper published in the latest issue of the journal Economic Anthropology (PDF here). A presentation on the paper can be seen here. 22 October 2015: The Guardian reports: “Hailed as the UK’s most sustainable historic building, the Regent Street office scheme, 7 Air Street, comes with an ecological roof incorporating flowers, vegetation, grasses and habitats for insects, birds and bats. The building has received BREEAM outstanding rating, the highest award possible from the industry body which judges best practice for sustainability in the built environment. 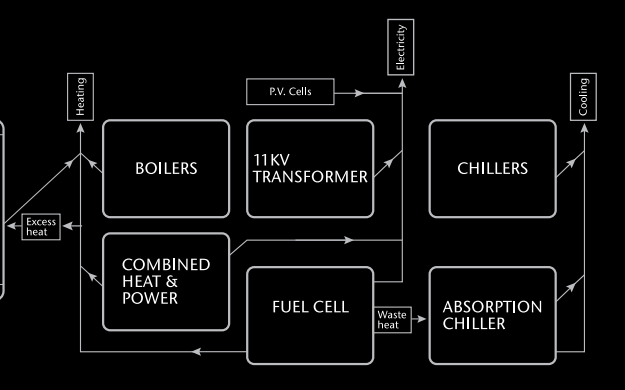 A previous post provides some additional details behind the fuel cell technology used. GE’s Jenbacher units will run a combined heat and power (CHP) configuration to generate 2.96 megawatts (MW) for the area enough electricity to power more than 5,700 standard U.K. homes. Once operational in 2016, the CHP configuration will power the on-site Energy Centre, export electricity to the grid and provide heat to Nova residents and businesses as well as reduce carbon emissions. Based on 8,000 operating hours per year, the gas CHP is expected to offset more than 6,500 tons of carbon dioxide. The Mayor’s planning decision from 2012 provides some additional background to the energy strategy of the development. Energy strategies submitted as part of the planning application for the development can be downloaded here and here. April 2014: On Wednesday 2nd April 2014 the Greater London Authority hosted a workshop focussing on the Business Case and Business Planning for Decentralised Energy projects. The event included an introduction from Matthew Pencharz – Senior Advisor, Environment and Energy (GLA), case studies and an open discussion amongst all attendees. The workshop hosted speakers from the London Borough of Enfield, Westminster City Council, Arup and the GLA. Attendees included energy consultants, engineers and local authorities. June 2013: Analysis by consultancy WSP in their report – ‘Solar Success: Space Not Cash the Key for Solar’ reflects previous posts by Energy for London (see here and here), highlighting London’s poor progress when compared to other regions in relation to the installation of solar photovoltaic systems. The conclusions summarise the Feed in Tariff Installation report data, produced by energy regulator Ofgem, highlighting local authority installations per 10,000 households. The analysis shows that London boroughs make up 23 of the 25 lowest ranking local authorities for solar installations and the entire bottom 10 in the national league table. 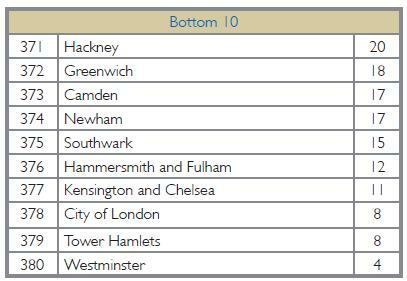 Westminster, Tower Hamlets, the City of London, Kensington and Chelsea, Hammersmith and Fulham, and Southwark are all found in the bottom five. Link to report here and directly downloadable here. June 2013: “A scientific experiment to prove or disprove green-building theories is to be undertaken by Grosvenor, the Duke of Westminster’s property company. Two almost-identical grotty hotels in Belgravia are the test bed. Two weeks ago, Grosvenor obtained permission to rebuild 119 Ebury Street using the latest energy-saving materials. The Grade II-listed shell will be converted into three rented flats, and the energy use monitored. Read full Evening Standard story here. Further information on technologies to be employed at 119 Ebury St – which include solar PV, solar thermal, air source heat pump and ‘phase change’ internal wall insulation, can be found on the following planning report by Westminster Council – and a lot more detail can be found on the development’s sustainability planning application reports here. The West End Commission was convened by Westminster City Council in summer 2012 to review, explore and set out recommendations for the continued and future success of the West End of London.